Standard annuities are lower by up to 2% after the 15-year gilt yields fall 26 basis points. Developing countries have experienced liquidity problems since the US Fed started tapering the $85bn stimulus sending investor funds to safe havens such as bonds and gilts. The 15-year gilt yields have reduced by 26 basis points after poor jobs data from the US suggested economic growth was slowing. Measures to further reduce the US stimulus package have impacted on markets in developing countries. The stimulus measures have resulted in large amounts of funds being invested in these markets and the tapering is causing liquidity shortages sending currencies lower. Investors are now moving their funds out of these markets to safe havens such as US Treasury notes and UK government gilts. Even though less stimulus would result in a lower price and higher yields, it current has the opposite effect with investor fear of developing market crisis driving prices up and yields down. Standard providers decreased their rates by 1.17% and we would expect so see a further decrease of about 1.43% in the short term but in the medium term of 3 months they can increase by 1.39%. Although smoker and enhanced annuity providers increased their rates by 1.15% on average and a decrease of 3.75% is possible in the short term but in the medium term of 3 months the decrease is less at 0.43%. 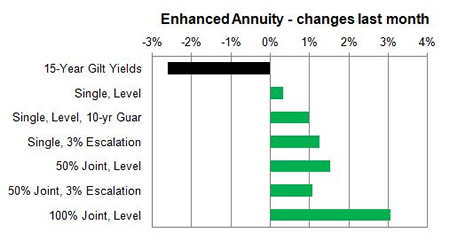 Enhanced and smoker annuities represented 90% of the increases in rates as providers become more competitive and ignore the fall in gilt yields after a sluggish start to the year. Standard annuities represented 86% of lower annuity rates in particular after falls from Legal & General and Canada Life. Equity markets started at 6,749 and decrease 239 points to end at 6,510. This represents a 3.54% fall and for people that remain invested have seen their fund decrease in value which has been made worse with a fall in pension annuity rates. 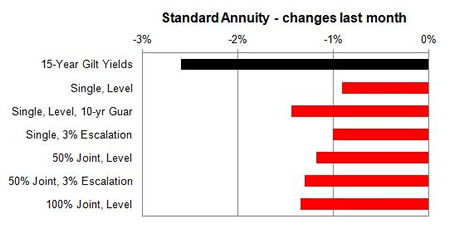 Standard annuities decreased by half of the fall from gilt yields although this is offset by annuities falling the previous month while yields increased. For enhanced and smoker annuity rates there has been increases while yields decrease although this is offset by annuities falling the previous month while yields increased. Impaired providers have started to increase their rates after a period where they reduced rates. 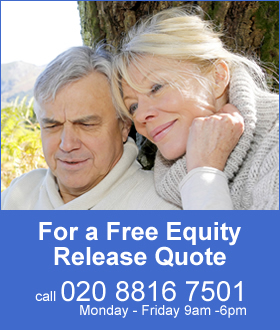 See Annuity Rates Review For the latest updates. Concern over tapering the US stimulus package has resulted in liquidity shortages in developing countries and panicked investors taking their profits by seeking safe havens in the US, Europe and UK buying bonds and gilts. This has had the effect of reducing yields when an increase would have resulted with lower gilt prices and higher yields.